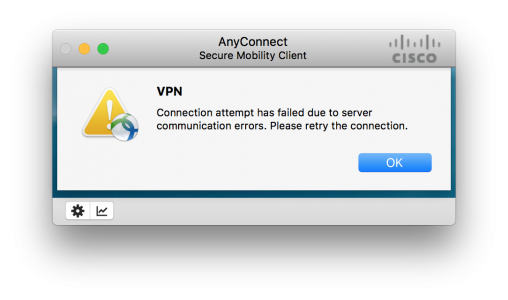 I used my Windows 10 VM and that connected fine, only my MacBook could not connect, this VPN tunnel is a big deal I need it to get onto client’s networks. I tried my other VPN connections and every one was fine, only the recently rebuilt one didn’t work? Ive seen OSX throw a wobbly with AnyConnect in the past so I did a complete uninstall, deleted the opt/cisco folder and put on the latest version (4.4.00243 at time of writing) no change. A look in the client message history showed me this..
No valid certificates available for authentication. 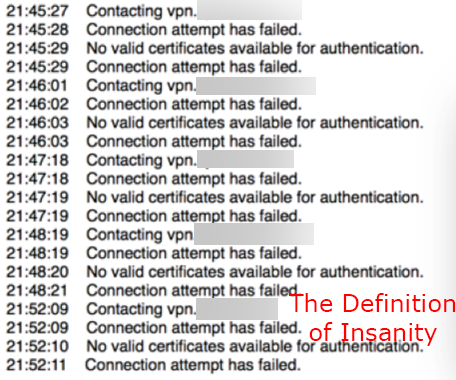 I checked my certificates, and the certificate on the firewall both they, (and the certificate chain,) were fine. debug ssl enabled at level 255. Try Googling that and getting a result! In fact that’s probably what brought you here. If you change a Cisco OS and things like this stop working normally it’s because they’ve dropped support for something that’s got a security hole in it. In the wake of the Poodle Exploit I assumed it was an SSL/TLS problem, but that wasn’t it. I was in the right ball park though, and a bit of lateral thinking and SSL cipher problems I’ve had with ASDM, made me think, what if it’s SHA that’s been dropped because everyone is dropping SHA1 cause it’s the hashing algorithm of Satan? Well as soon as I added a SHA1 ciphers back in, everything started working again! WARNING: This command has been deprecated; use 'ssl cipher' instead. INFO: Converting to: ssl cipher default custom "AES256-SHA:AES128-SHA"
INFO: Converting to: ssl cipher tlsv1 custom "AES256-SHA:AES128-SHA"
INFO: Converting to: ssl cipher dtlsv1 custom "AES256-SHA:AES128-SHA"
This fixed my problem as well. An excellent tip. I’m not an IT specialist, how to add SHA1 ciphers in ASA. I’m using linux as a native system. But if you are using a purchased third party certificate simply renew it for one that’s signed with SHA256 – most certificate vendors will do this for free!